Huawei Diesel Hybrid Power Solution - D1 Series, is applicable in off-grid or poor-gird areas where power consumption is high (1~3KW). It adopts DieselMax technology to help resolve issues with low generator conversion efficiency, high fuel consumption, and heavy maintenance workload. Its design is also highly integrated, which discourages theft, shrinks the footprint, and accelerates deployment. DieselMax technology largely improves energy converting efficiency and saves up to 75% fuel, 90% D.G. running time and 97.5% maintenance. Integrated design with D.G., energy storage, controller and converter, etc. Saving 75% footprint and deployment cost. Modular design, easy expansion, saving customer future investment. 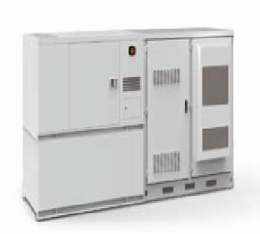 Huawei Diesel Hybrid Power Solution is widely used in Africa and the Middle East, helping carriers like MTN, Zain, Etisalat, CMPak resolve their site power supply difficulties in off-grid and poor-grid areas.